ESA/Univ. of Utrecht/J.Vink et al. Recent close-ups of an undulating ringed nebula (RCW 86) underscore the role of electric discharge in the formation and continuing energetic displays of such structures. Before the space age, astronomers could look at the stars only in the optical wavelengths that twinkled down to the surface of the Earth. They thought that the rings of luminous haze around some stars (which they called planetary nebulas) were spherical shells of gas expelled when the stars exploded. 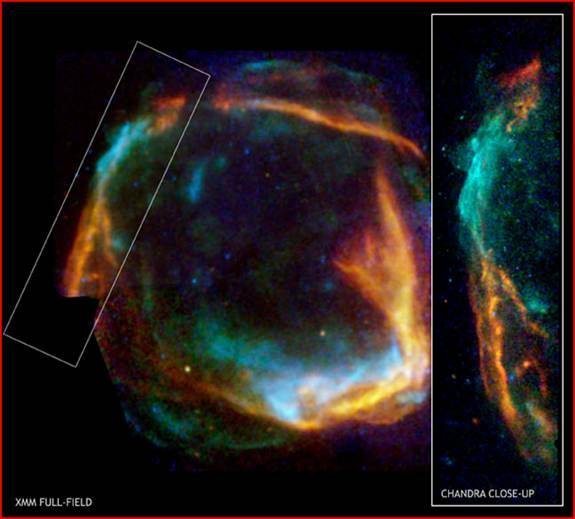 The image above emphasizes the ring structure around such stars. Because plasma is composed of some fraction of charged particles, its movement constitutes an electric current. In fact, space plasmas are generally laced with networks of filamentary currents. The rings are toroidal circuits coupled to and driven by the hourglass-shaped current sheets. As such, they are subject to what’s called the “diocotron instability”: The current tends to form vortices along its periphery and to evolve into distorted curlicue shapes. This phenomenon has been documented in many lab experiments and can be observed in auroral curtains. The diocotron instability in this ring current around RCW 86 has just begun. Part of the first curl is much dimmer than the rest, giving the impression of a snake eating its tail. An ancient symbol for this figure is the ouroboros. Scholars of comparative mythology have found that ancient themes were inspired by events witnessed in the ancient sky. That these events were extraordinary plasma displays has been corroborated by recent findings in the study of rock art: petroglyphs, petrographs, and geoglyphs—rock structures such as Stonehenge—reproduce exactly the forms of plasma discharge instabilities. 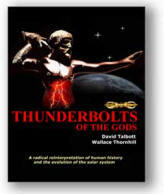 The conclusion is unavoidable that ancient peoples witnessed the effects of a current surge in the circuits connecting Earth, Sun, and galaxy. This stellar-scale ouroboros around RCW 86 is probably many orders of magnitude more energetic than the purported “enhanced aurora” in the ancient sky of Earth. But in light of all the artistic, spiritual, and philosophical uses to which the ouroboros has been adapted since its first appearance, this image can serve as a reminder of the ouroboros’s likely origin in an electric sky.